Electronic pet containment systems or Hidden Fences have kept pets safe in their yards for more than 40 years. To date, there have been several million of these systems used successfully around the world. The people who seek out these training aids are often having problems managing their pet’s movements and are anxious for a solution. They are worried about the safety of their pet and also the risk of it being impounded. In some cases the owners may have acquired an unsuitable animal for their lifestyle but are now truly bonded to their pet. In other cases, the cost of fencing an adequate space of the pet is cost prohibitive for the owner or fencing may not be possible (e.g rental accommodation) or clash with other values held by the owner (aesthetics of their property) or council overlays. Electronic containment systems were developed as a method of safely containing dogs to their owners’ properties. They are an evolution of the electric fences used to contain livestock on farms, wildlife parks and in zoos. Hidden Fences work because the consequences of approaching the boundary are clearly communicated to the animal every single time it approaches the boundary. It could be argued that hidden fences may be more effective for containing pets safely while maximizing their welfare, than traditional fencing. Helps protect native wildlife from domestic animal interaction. It is also possible that hidden fences may help reduce unwanted pregnancies amongst domestic pets by reducing roaming. There is considerable concern amongst welfare groups within Australia as to the safety of Hidden Fences. Some of the concerns are philosophical, afterall the systems use an aversive (the application of something unpleasant or discomfort to reduce the occurrence of a behaviour) and in general it is preferable to manage animals in a positive and rewarding manner. However, consequence is a natural part of the way animals learn and the safety of the systems is well documented so this concern may be more philosophical than practical. What is an Electronic Pet Containment System (hidden fence)? An electronic pet containment system is a means of restricting animals to an area by associating an artificial boundary with an unpleasant sensation in such a way that the animal perceives the boundary as the source of the unpleasant sensation and will voluntarily avoid the area. The basic electronic pet containment system consists of a transmitter, boundary wire and a receiver. The transmitter sends a radio signal through a wire that surrounds the area of a client’s property where the animal is to be safely contained. A traditional pet collar is equipped with a small, lightweight receiver, which picks up the signal if the pet approaches the signal field. An audible tone or vibration alerts the pet that it is approaching its boundary. If the pet should ignore the tone and not retreat from the boundary, it will receive a customised, aversive electrical stimulation (ES) to reinforce the rule of avoidance taught during the training. This training period is very important to teach the animal where the boundary lies and the consequences of approaching it and how to know when it is getting too close to the boundary. The introduction of a pet on a hidden fence is carefully executed by operant conditioning fundamentals. The pet is exposed to the cue that indicates if it continues towards the boundary it will receive an ES. The boundary is clearly marked for the pet using existing boundaries such as an existing fence or line of trees and flags that are eventually removed. The ES is delivered below the animal’s threshold of discomfort (TOD). When the animal displays signs of mild discomfort or uncertainty when the ES is applied, this is the level of the ES used in training. This may mean the animal hesitates or looks away from the boundary or pulls its ears back. Only after the pet is showing acceptable signs of boundary recognition is the ES increased. The pet must demonstrate that it knows how to avoid the consequences of approaching the boundary and so can choose to avoid the ES. If the animal is highly motivated to cross a boundary, for example to chase livestock or escape the property, a stronger ES that elicits stronger behavioural responses (such as vocalising) may be needed to override the reward the animal receives through escaping the property. It is important to note that the owner is given on-site instruction on training the pet (via instruction by a Hidden Fence representative) to the boundary (visibly marked with white flags) for several days. During this time, the pet receives the audible tone and the lowest threshold of stimulus that displays a mild body language response. Often electronic pet containment systems and electronic training collars generically are referred to as “shock” collars. This is not an accurate description of the way the electronic containment systems function and biases public opinion about the devices preventing careful consideration of the value and the costs of using these systems for animal welfare. Electric shock is the sudden application of electric current to a living organism with sufficient strength and duration to produce a convulsive or thermal effect (IEC) with injurious exposure consequences (Reilly 1998). Typically electronic shocks occur when mains electricity accidentally travels through an animal’s or human’s body to earth. On many websites concerning animal welfare, there are multiple uses of the words “shock collars” when describing electronic training collars. These websites often use such words to enhance their position on why not to use electronic dog fences. Often the written material deals in absolutes and frame the use of an electronic collar such that it “will” cause harmful effects such as “burning skin” and “convulsions”, “detrimental behavioural distress” and that the electronic training collars are “ineffective” overall. The RSPCA website details clearly its philosophy and opinion on electronic collars by opposing the use of the devices with a strong concern of misuse more so than the devices themselves. The word “shock” is still used, but far more conservatively. Presumably, if electronic pet containment products are inflicting the harmful effects various groups would like to propagandise (Orion v RSPCA Vic), there would be epidemic proportions of pets ending up in veterinary clinics and quantified cases of lawsuits as direct results of the use of such devices. It could be argued that more pets end up in veterinary clinics as the results of poor physical fencing issues or being tethered inappropriately. This type of propaganda is both inaccurate and opinion only. Research investigating the effectiveness of electronic dog fences and electronic training collars has shown repeatedly that the devices do not cause injury and when used with understanding of operant training principles, are very effective teaching tools. While hidden fences are effective tools, the welfare aspects of them need to be considered as some organisations object to them on welfare grounds. The field of animal welfare provides a framework for assessing hidden fences in an orderly manner. Animal welfare is a large and varied field with a wide range of viewpoints expressed. Overall, it is the preservation of an ideal that animals should not suffer unnecessarily, whether they are companions, used for work, food or research. The RSPCA has a “Five Freedoms” charter that largely covers the definition overall, yet broadens its reach. The freedoms cover many of the concerns for companion, working and food animals. EPCS support three of the five freedoms. Freedom of pain, injury or disease: Safely containing pets to the owner’s property keeps them safe from injury caused by cars and other vehicles, fighting with other animals. By containing the animal to the owner’s property, the pet is less at risk from infectious diseases transmitted through uncontrolled contact with other animals (feline HIV virus, Infectious Canine cough, Canine distemper). It could be argued that the hidden fences cause pain to the animals they contain. As discussed earlier, the ES delivered by the hidden fence stimulates nociceptors at low to medium levels creating a prickling sensation felt on the skin. The sensation is not perceived as pain. Due to the animals inability to rationalise, the disturbing sensation is received with a startling body language affect, in which the pet chooses an alternative behaviour. Freedom to express normal behaviour: The expression of normal species behaviour may be aided by Hidden Fence as many owners create a larger area with an Hidden Fence than they do with traditional fencing. Increasing space available to confined animals reduces some abnormal behaviours as the animal has the space to perform normal behaviour and to avoid or interact other animals housed with it. Freedom from fear and distress: Mental distress is created when the individual has limited ability to predict events, positive or negative, in their environment. Being able to predict when food will be delivered, knowing where water can be found and having resting spaces and regular interaction with others of the same or other species all add to mental wellbeing. Clear signals that allow the animal to predict and avoid a negative event is always a goal for any trainer attempting to establish or extinguish a behaviour. When applied correctly, hidden fence can actually make these messages cleaner and clearer than any other method. In a comparison of 3 different training systems for training a police dog, the electronic training collar was found to induce less stress and had a stronger learning effect than a pinch collar or a signal to stop the behaviour (E. Schalke, Salgirli, Bohm, Ott and Hackbarth. Hannover University 2008). Overall the electronic collar was found to be the most effective training method as it caused the shortest period of distress with the strongest learning effect. Most would agree that reward based training is the socially preferred option; yet aversive training balanced in combination with reward training would most likely be the more common method practiced by the everyday pet owner. Results would appear to be adequate in satisfying general behaviour issues. 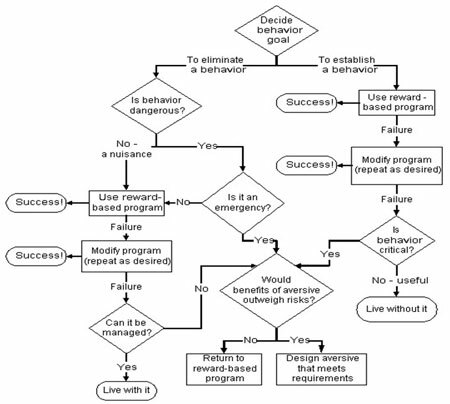 Below is an example of the choice process when concluding a direction for domestic animal behavioural modification. The algorithm was designed by the Delta Society in 2003. Analysis of the Delta chart would appear that when behaviour is critical or poses significant risk to the pet’s safety, there are direct links to the use of an aversive method of behaviour modification. Some may argue that Hidden Fences cause mental distress as the animal has to experience the ES and then figure out how to avoid it. In doing this it may receive repeated ES. All learning causes some stress but when the principles of operant conditioning are used, learning is generally effective. As the outcomes for not containing the animals are much more distressing for them (injury, being impounded), a short period of discomfort that has clear endpoints is justifiable when the owner has exhausted other less aversive avenues for containing their pet. This idea of a short amount of discomfort for longer term better welfare is regularly used in managing animal health and welfare. Vaccination and microchipping are commonly performed procedures for domestic pets that cause short term discomfort for improved welfare. Vaccination prevents diseases, some of which may be fatal while microchipping allows fast identification of an animal’s owner so it may be returned to the owner in event of it becoming lost or stolen. Overall, most owners and caretakers of companion animals would claim they do their very best to uphold a reasonable standard of animal welfare and would not intentionally harm or traumatise their pets. So who uses Electronic Pet Containment Systems? Electric dog fences are widely used around the world and supported by animal welfare organisations such as the Delta Society and the ASPCA. Over 30 developed countries allow electronic pet containment systems to manage pets practically, affordably, and safely. Pet owners, in great numbers throughout the world use hidden fences with confidence that they are safe and will contain there pet without causing them harm. The Distribution of Electronic dog fences is global. These behavioral management systems were invented in 1973 and since their introduction have kept millions of pets safe at home, helped in managing and modifying pets behavior problems and possibly saved pets lives. In our “on the ground” observation and evidence in sales, hidden fence systems have grown in popularity every year. Many of our customers have tried most everything to contain their pets, and have failed. The customers that have tried reward methods and lifestyle enrichment techniques to keep their pets from wandering have all reported a failure. With average reports of 15% sales increases over the past 12 years servicing the Australian market, evidence would suggest that these systems are not committing any significant welfare disadvantages, but have ultimately have maximized these particular pets lives and lifestyles. The electronic pet containment industry is one the largest in the world for pet products and generates an estimated $100M annually. Sales of these training tools have continued to grow since 1973. Electronic pet containment systems have evolved with technology. The systems available today by reputable manufactures have done their very best to maximise the safety features and operations of these devices. However, it should not be as simple as just having EPCS available to pet owners to purchase. These are complex systems and consideration must be given as to whether a EPCS is suitable not only for the property but also for the pet. A poorly laid out EPCS does not allow the pet to identify its boundaries easily. Poor training prevents the pet from clearly learning how to avoid the ES. Animal welfare may be compromised with poor implementation of the systems- but this is true of all training devices and programs. Hidden Fence Company prides itself on its significant effort to excel in minimal aversive containment training. Although Hidden Fence is a business, it’s also a group of individuals with a strong love for animals and animal welfare. As such, clear protocols are in place to help decide if an EPCS is suitable for the client’s situation. Before concluding that a hidden fence may be an answer for the pets escaping habits, there are a few questions that can help with the process. Is there a solution of containment that can be successful without the use of a containment system? i.e. : fixing existing fence, erecting a fence, chaining pet, raising existing fence, etc. Is the pet at risk of harming itself?, i.e. : hanging itself on fence while tethered, getting stuck under fence, inflicting individual harm through panic behaviour, escaping resulting in injury or death, etc. Does the pets escaping behaviour pose an imminent threat to its environment or ramifications thereof? I.e. : potential cause of motor vehicle accidents, attacking native wildlife, displays of aggression to humans or other domestic pets due to fear and anxiety. Will the pet will be free to move about the property with relatively sizeable space, unchained or uninhibited from movement. If not, and the pet is chained or restricted from freedom of adequate movement, could this not be perceived as a welfare issue? Do local laws prohibit wandering pets? Most councils have laws regarding wandering pets. Fines could be too costly resulting in owner giving pet away or ending up at a welfare facility, which the problem of escaping becomes habitual. Owner or Council may order pet euthanized, although rare. Does the owner have the financial means of properly containing their pet? If not, inadequate fencing may be installed, possibly hazardous or unsightly to neighbours. If not, the pet may continue to run loose or be given away. If not, pet may be chained or kennelled, possibly euthanized (although rare). Is the critical risk of harm greater than the e-stimulus? This is ultimately a question of “do the ends justify the means”? Are we going to have a pet that is alive and unharmed versus a scared lost pet, dead, injured, stolen or abused, being attacked by domestic pets or wildlife, catching disease, poisoned or baited? Research, reviewed in Lindsay (2000) has shown that e-stimulus does not cause physical damage, either permanent or temporary, to the animals; so the concern ultimately remains on the well being of the pets. EPCS have been continually developing from when they were first used over 30 years ago. Modern systems are sophisticated and utilise operant conditioning principles to effectively teach animals where property boundaries lie. The devices do not deliver electric shocks as many animal welfare organisations in Australia suggest but work and electronic stimulation (ES) causing nociceptors to fire creating a prickling sensation in the skin. 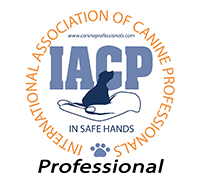 When installed correctly and training is conducted correctly, animal welfare is enhanced as pets are safely contained in a large area where they can move freely. They understand how to avoid the unpleasant ES. This coupled with evidence that the collars do not cause “electric shocks” or lasting damage makes it surprising that welfare organisations do not support the use of EPCS in Australia. Overseas, many animal welfare groups do support their use while recognising that positive reinforcement methods are desirable but not always practical. Overall, the electronic pet containment industry has attempted to keep our pets from injuring themselves via wandering/escaping, disrupting our neighbours, possibly causing damage or injury to others. Electronic pet containment systems are an inexpensive, reliable, humane and a safe means of managing the movement of pets that could save its life.